Κίνητρό μας η αξιοποίηση της δεκάχρονης εικαστικής δράσης του Ορίζοντα και γενικότερης αναζήτησης γύρω από τον σύγχρονο πολιτισμό. Με την ανάδειξη – παρουσίαση όψεων της ανεξάρτητης εικαστικής σκέψης και δημιουργίας στην Ελλάδα του σήμερα, επιδιώκουμε τη χαρτογράφηση και δικτύωση των καλλιτεχνών στο εσωτερικό όσο και στο διεθνές περιβάλλον. Το υλικό που θα προκύψει από το συμπόσιο θα δημοσιευθεί. 1.n. (Astronomy). A notional boundary around a black hole beyond which no light or other radiation can escape. # (Quantum Physics) The point where time dilates so much that everything happens simultaneously. 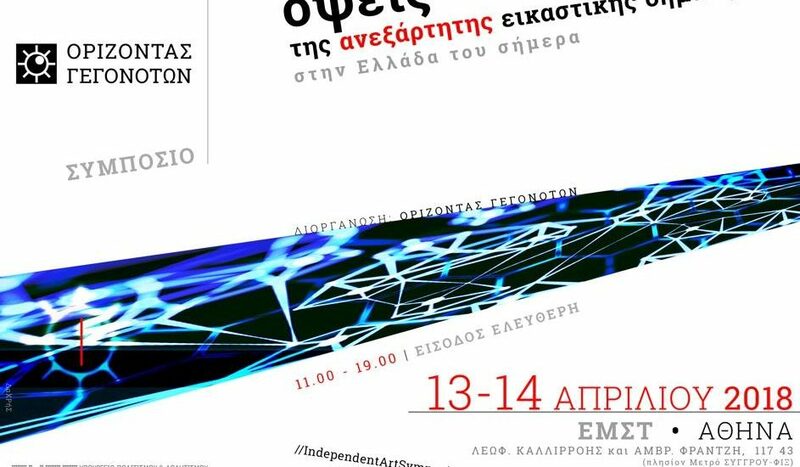 Orizontas Gegonoton is organizing a two-day Symposium titled “Aspects of Independent Artistic Creation in Greece today”. Our aim is to develop a meaningful dialogue between all participants that can provide not only the appropriate feedback to the present and future discourse, but also contribute to developments in the areas of Culture, Education and the Arts. Our incentive is to assess the group’s ten-year active participation in the art scene and present and highlight aspects of the independent visual arts in Greece today, exploring their potential of reference and representation abroad. The symposium will be held in April 2018, at the National Museum of Contemporary Art, Athens, with the participation of artists, art education institutes and independent art groups, organisations and institutions, the scientific and teaching staff of Secondary and Higher Education, academics and researchers in the fields of Art, Education, Philosophy, Sociology and the Humanities. Contributions will be in the form of 15-minute presentations or posters or workshops, leading to fruitful interventions and constructive conversation. – Aspects of independent artistic expression and gesture. – Areas of multiple artistic action and their role in the production of culture. – Independent visual language, its relation to society, and its political-economic dimension. – Independent Art, curators, collectors, and the Mass Media. The Art market in Greece, past and present. – Art, education, urban planning and society. Creative learning. Linking culture and education. The proceedings of the symposium will be published. Entrance will be free to the public. 15:30 / Μάνος Στεφανίδης (Ιστορικός, Κριτικός Τέχνης): Η τέχνη του δρόμου, ο δρόμος της τέχνης, η τέχνη στον δρόμο. Μη φοβάσαι την τέχνη!